In the nineteenth century, the first living mannequins, or "manikins," took their name from the static dummy or lay figure they were soon to replace as the principal form of display in the dress-maker's salon. While the word "mannequin"-in French, le mannequin-described the woman, the word "model"- le modèle-designated the gown she exhibited in the salon. The model gown was a one-off that did not go into production; it was thus both an exclusive dress for sale to an individual client, and a prototype (hence the term model) sold to a fashion buyer for adaptation to the mass market. Both model gowns and model women were at the heart of the commercial development of the French couture industry and its global markets, and there was always some confusion in the terminology. The dual meaning of the word "model" also signals the ambivalent status of the earliest fashion models, hovering uneasily between subject- and object-hood. They invoked both admiration and disapproval, disconcerting their critics precisely because they wore fashionable dress in public for money rather than for its own sake. Charles Frederick Worth is generally thought to be the first couturier to use live models. However, many nineteenth-century dressmakers had a young woman available to put on a dress for a client, although their primary mode of display was a wooden or wicker dummy. Indeed, Worth met his future wife, Marie, while she was employed to model shawls to customers on the shop floor of their mutual employer, the mercer Gagelin et Opigez. The couple set up their first maison de couture in 1858, and Marie modeled in the Worth salons until the 1870s, after which she remained responsible for training the house mannequins. Maison Worth's real innovation was thus to institutionalize the profession within the increasingly bureaucratic structure of a couture house, having several trained house mannequins, rather than using the occasional petit main, or seamstress, as a model. Lady Duff Gordon, trading as Lucile, claimed to have started the first mannequin parades in London in the late 1890s. She trained her mannequins in carriage and deportment and gave them stage names such as Hebe, Gamela, and Dolores. Often six feet tall, they struck dramatic poses during the parades but barely smiled and never spoke. When Lucile opened in New York in 1910 and then Paris in 1911, she took with her four of her London mannequins whose glamour was widely reported in the press of both continents. Dolores later joined the Ziegfeld Follies, and there are many parallels between the fashion model and the chorus girl. In the same period, fashion magazines began to use photography alongside fashion illustrations, but the women in these photographs were often actresses and, later, society women, rather than professional mannequins, and, with some notable exceptions, the two career paths-photographic and catwalk models-remained separate until well into the 1960s. Catwalk modeling was always a specialist option. Mannequins were full-time employees of the house and sometimes even lived in. In Paris, both Paquin and Poiret were in the vanguard in showing their fashions on live mannequins, but between 1900 and 1910 most couture houses had their cabine, or studio, of mannequins. Although poorly paid and barely respectable, they were also considered exceptionally glamorous. From behind the scenes, they would be summoned several times a day to model gowns for private customers and professional buyers alike, under the direction of the vendeuse. Until approximately 1907, they wore a high-necked and long-sleeved black satin sheath, or fourrure, beneath the luxury gowns; although generally believed to designate their lack of respectability, the fourrure must also have facilitated the rapid costume changes required. The appearance of three paid mannequins with an unnamed couturier at the Auteil racecourse in 1908 caused outrage, but the practice rapidly became common. In 1910, Poiret made a film of a mannequin parade, and in 1911 he toured Europe with a troupe of uniformed mannequins. In 1913, both he and Paquin undertook mannequin tours of the United States; in one town, the host department store responded to Paquin's mannequins with a matching parade of American male mannequins. 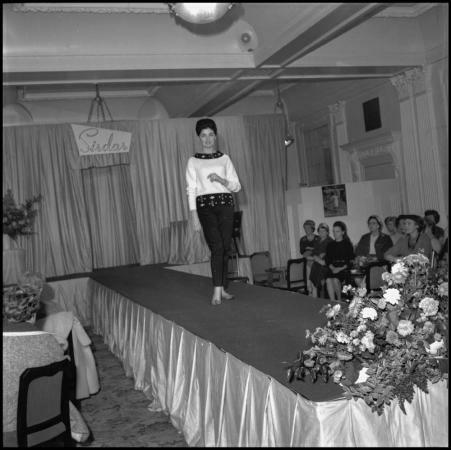 Department stores in the United States were, if anything, ahead of Parisian couturiers in pioneering the use of models in dramatic fashion shows. In 1924, Jean Patou traveled to New York to recruit six American mannequins to model in Paris for his American customers whose physique, he claimed, was longer and leaner than that of the "rounded French Venus." 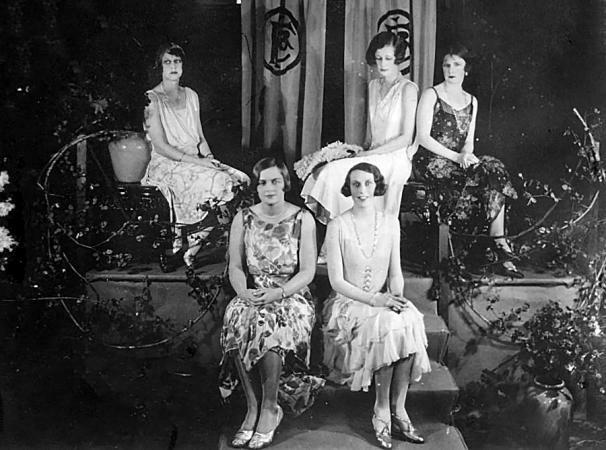 Paquin, Poiret, and Patou understood the importance of showing on live models in the marketing of modern fashion. All were able to harness innovative publicity techniques to the early twentieth-century desire to see fashion in motion. John Powers opened the first American model agency in 1923; the Ford modeling agency was founded in 1946. By contrast, the first French model agency opened only in 1959, perhaps because French fashion houses had always employed their own models. In New York in the 1920s, there was also a mannequins' school dedicated to teaching fashion modeling techniques. By the 1920s, fashion journalists were beginning to report not only on the seasonal fashions, but equally on individual mannequins from the Paris "openings." Captain Molyneux's principal mannequin, Sumurun (Vera Ashby), was well known; in the 1930s, the in-house mannequins of the London department store Selfridges were popular figures, while Schiaparelli's mannequin Lud was reputed to be married to a lion-tamer. After World War II, the profession of model acquired some respectability, perhaps due to cinematic representations of models in films such as Cover Girl (1944), Funny Face (1957), and Blowup (1966). The social status of models improved as several married into the aristocracy. Modeling styles changed. From the early twentieth-century the mannequin had been required to move sedately in the salon, notwithstanding the risqué connotations of Lucile's "goddesses" and Poiret's undulating mannequins. By contrast, when, in 1947, Christian Dior showed his "New Look," he encouraged his models to do theatrical turns, knocking over ashtrays in the audience as their coats swung round. However, in general modeling styles remained staid and the 1950s' model was required to look haughty and disdainful. Paris fashion houses maintained a cabine of fourteen to eighteen models, and there tended to be a "house style" of modeling, although each model was a different physical type to represent the range of clients' looks. It was therefore, revolutionary when, in the late 1950s, the British designer Mary Quant first showed on photographic mannequins who danced frenetically to jazz music and then froze in graphic, static poses on the catwalk. Quant laid the path for the innovations of the 1960s when the development of ready-to-wear required a different kind of presentation. Now models were required to dance, act, and clown on the catwalk. In Courrèges's futurist collection of 1965, grinning models danced in experimental kinetic movement to musique concrète. Marie Helvin recalled that haute couture modeling in the 1960s and 1970s was about contact with hand-made, one-off clothes, whereas showstopping modeling techniques, photogenic beauty, and the showgirl instinct were the prerequisites of the ready-to-wear show. Until then, models had been poorly paid, but their compensation went rocketing up in this period; top models could command $1,000 for a one-hour show in Milan and even a little more for one in Paris. The strict separation between house mannequins and photographic models began to be eroded and the proliferation of media images of the young, beautiful, and fashionable in the 1960s ensured that photographic models like Jean Shrimpton ("the Shrimp") and Twiggy became iconic figures of their times. The rise of the supermodel in the early 1990s was followed by a fashion for more waiflike models with slighter frames and quirkier looks. Their salaries, however, did not shrink correspondingly. By the end of the twentieth century, models were firmly established as the new celebrities. Feted in gossip columns and highly compensated, they were far removed from their early twentieth-century predecessors with their dubious status and poor pay. Nevertheless, and despite the high visibility of the black model Naomi Campbell, models of color continue to be underrepresented in the industry at the beginning of the twenty-first century. See also Mannequins; Jean Patou; Mary Quant; Twiggy; Charles Frederick Worth. Ballard, Bettina. In My Fashion. London: Secker and Warburg; New York: David McKay Company, 1960. Pierre Balmain. My Years and Seasons. Translated by Edward Lanchberry with Gordon Young. London: Cassell, 1964. Bertin, Célia. Paris à la Mode. Translated by Marjorie Deans, London: V. Gollancz, 1956. Castle, Charles. Model Girl. Newton Abott, U.K.: David and Charles, 1977. De Marly, Diana. Worth: Father of Haute Couture. London: Elm Tree Books, 1980. Evans, Caroline. "Living Dolls: Mannequins, Models and Modernity." In The Body Politic. Edited by Julian Stair, 103-116. London: Crafts Council, 2000. --. "The Enchanted Spectacle." Fashion Theory 5, no. 3 (2001): 271-310. Etherington-Smith, Meredith, and Jeremy Pilcher. The "It" Girls. London: Hamish Hamilton, 1986. Gordon, Lucy Wallace Duff, Lady. Discretions and Indiscretions. London: Jarrolds, 1932. Gross, Michael. Model: The Ugly Business of Beautiful Women. London and New York: Bantam, 1995. Helvin, Marie. Catwalk. London: Pavilion Books, 1985. Kaplan, Joel H., and Sheila Stowell. Theatre and Fashion: From Oscar Wilde to the Suffragettes. Cambridge, U.K.: Cambridge University Press, 1994. Keenan, Bridget. The Women We Wanted to Look Like. London: Macmillan, 1977. Liaut, Jean-Noël. Cover Girls and Supermodels 1945-1965. Translated by Robin Buss. London and New York: Marion Boyars, 1996. Paul Poiret. My First Fifty Years. Translated by Stephen Hayden Guest. London: V. Gollancz, 1931. Seebohm, Caroline. The Man Who Was Vogue: The Life and Times of Condé Nast. London: Weidenfeld and Nicolson, 1982.